"I am so sorry to hear about your passing. You were one funny guy with a weird sense of humor. The way you approached what life threw at..."
Christopher Harris, 68, of Arlington, TX, born in Tyler and raised in Shady Grove, passed away peacefully on September 6th, 2018. Throughout his life, he dedicated himself to providing everything for his family. After retiring from Southwestern Bell, he was a fixture of Veterans Park, handing out bibles to those who asked, tending to flower beds, and being generous to strangers. Preceded in death by his parents, Dan and Frenchie Harris. He is survived by his son, Scott Harris, daughter, Shannon Shull, her husband, Robert Shull, their daughter, Julia Shull, and his three brothers and their families: Dan, Phil, and Reggie Harris. In lieu of flowers, the family would appreciate donations to the Dystonia Medical Research Foundation, https://www.dystonia-foundation.org/donate. 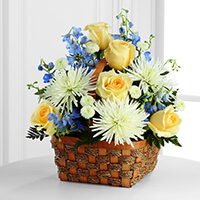 To send flowers to the family of Christopher Harris, please visit our Heartfelt Sympathies Store. I am so sorry to hear about your passing. You were one funny guy with a weird sense of humor. The way you approached what life threw at you was great. It was my distinct pleasure and honor to help take care of you. I appreciate the truth you and your family put in me. I will miss you dearly and Botox clinic will not be the same without you popping in every few months with a wry smile and something sarcastic and funny to say. I will miss you Mr. Harris and will miss Scott and Shannon bringing you in to see me. Rest in Peace!! Scott and Shannon. I am so incredibly sorry for your loss. Chris was a fun loving person and the world is a sadder place without him. I will always remember his laugh and smile.